Icelandic rock is mostly dark and basaltic, which is why we refer to some shorelines as our black sand beaches. When lava makes contact with water, it cools rapidly and shatters into sand fragmented debris. 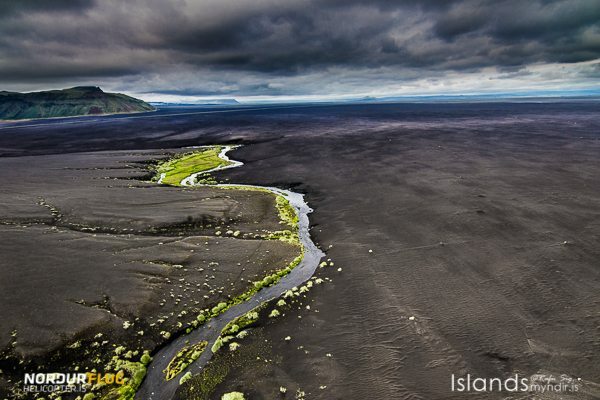 The black sand beaches are mystical, and totally worth making the trek to go see. Along the south coast you can find different versions of these beaches. There is an area of vast expanse where the beach seems to go on forever. Further up is where you find the free standing basalt rock formations that line the coast as cliffs or are standing alone, slowly being worn out by the tireless sea. This area is called Dyrholaey and it is not far from the small town of Vík. We can take you to see this famous area by helicopter on our Volcanoes and Glaciers tour, the Essential Iceland tour and the Glacier Lagoon Expedition, so you can truly take in the view!